Urban Outfitters (UO), a rapidly-expanding clothing store, asked DCC to recommend sound isolation treatments for their new store in the French Quarter area of New Orleans. UO wanted to retain the rustic look of the existing ceiling trusses in this former brewery building. However, occupied offices are directly above their space and high performance Bose loudspeaker systems will be installed to the ceiling throughout the store. As part of their image, UO plays 'urban' music for patrons, which contains substantial low-frequency content, which in turn might be audible in adjacent spaces. Based on noise measurements of music in several other UO stores, Figure 1 shows estimated sound levels in the office space assuming no acoustical treatment. This analysis shows that with no treatment, it is very likely that music in the 125-250 Hz range will be audible in the adjacent offices above the UO space. DCC recommended sound isolation measures including an airspace and additional mass, which will attenuate the sound to acceptable levels. 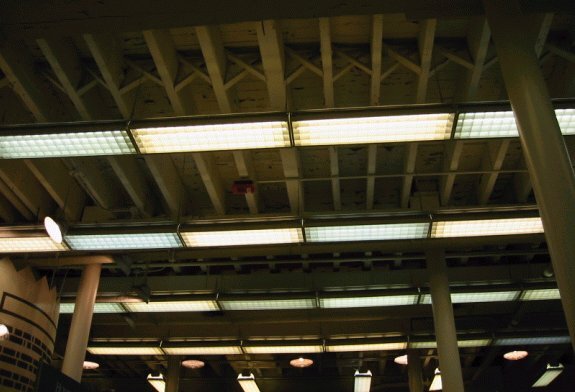 This treatment recommendation, shown in Figure 2, is a false ceiling between the trusses and suspended by spring isolators, and thus will allow UO to retain the exposed look of the wooden trusses.